Emma Rice’s adaptation of Daphne Du Maurier’s Rebecca treads the line expertly between intense drama and comic relief. ‘A study in jealousy’, the play tells the story of a young bride plagued by the presence of her husband’s late wife in his manor house on the coast. The production opens in an appropriately eerie manner, with smoke hanging in the air as a boat is lowered to the stage, with a woman’s body floating beneath. It’s a powerful image, cleverly designed to stick in your head throughout the play, just as the manifestation of Rebecca continues to afflict the new Mrs de Winter. 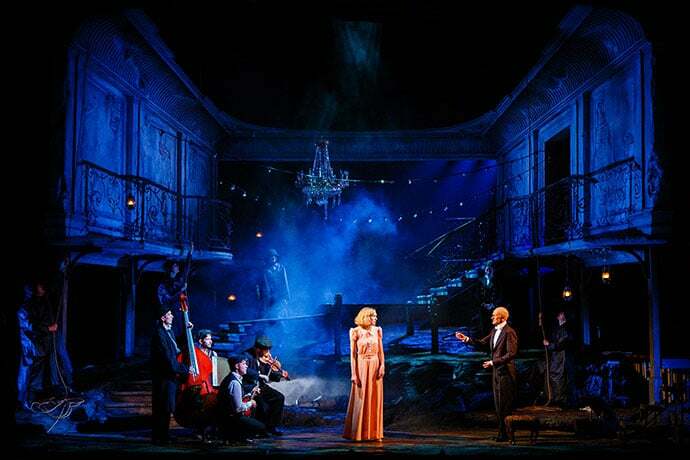 The set is impressive too; the boat remains centre stage until the final scene, bridging the gap between the outside and in as the walls of Manderley Manor encompass it. It’s an effective way of upholding Du Maurier’s fascination with the encroaching power of nature, as are the intermittent sea shanties sang by fishermen between scenes, showcasing how the sea (and in extension Rebecca) is never far from thought. However it’s not all gothic tropes and mystery. There’s a puppet dog, an almost show-stealing comic performance by Katy Owen as Robert/Ben, and the characters of Beatrice (Lizzie Winkler) and Giles (Andy Williams) offer up elements of melodrama and hilarity. Ewan Wardrop’s Maxim de Winter is suitably reserved; other than a couple of fleeting moments of anger, you don’t really see much of him until the moment his secrets are divulged. Undoubtedly, it’s the women in this play that are the stars of the show. Emily Raymond gives a chilling performance of the sinister Mrs Danvers and Imogen Sage as Mrs De Winter portrays her character’s development skilfully. With the help of Emma Rice, who has harnessed this transition in her adaptation, she is less of a victim as she shifts from a timid young woman to one who gains great strength, when finally stripped of her naivety. An adaptation of this scale is commendable; Du Maurier’s prose is so powerful that it would have been easy to lose a lot of what makes this story so enticing. Emma Rice captures this and more, producing a spellbinding show that is entertaining as much in its wit as in its romance and intrigue. 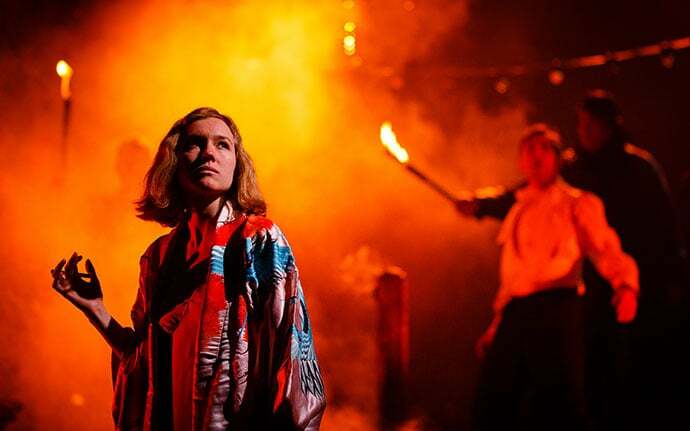 Rebecca is on at The Lyceum until Saturday November 28th. Head here for tickets and more information.